I’ve been avoiding this post for a while. It’s too personal. It’s not fun. And there’s really no way to even inject a bit of humor into the situation because you’re not supposed to joke about these kinds of things. 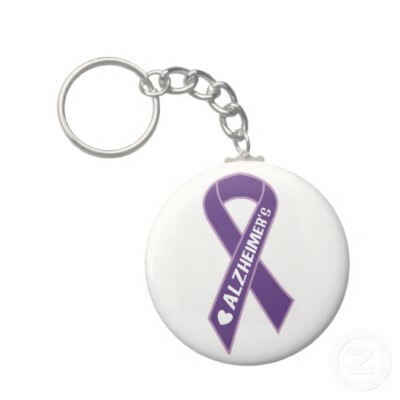 My grandmother has been diagnosed with Alzheimer’s disease. I’m not used to this sort of thing. No one in my family has ever had Alzheimer’s or breast cancer or any of those other “causes” that they ask you to donate a dollar for when you go to the supermarket. And while I don’t mean to trivialize either these diseases or the people who’ve been through them, I’m not used to ribbons or fund raisers or “raise awareness” campaigns. Heck, I wear pink all the time as a dance teacher and the one day I chose to vary my wardrobe last fall was the day we were supposed to be “celebrating” breast cancer. And I feel guilty. It’s no big secret that I think my grandparents are crazy (remember this post about the Philadelphia Flower Show or this one about the Cat Mobile?) but now there is a legitimate reason for it. My grandmother can’t help the fact that she tried to sip wine through a chop stick the other day. She can’t help the fact that she’s forgetting the dogs’ names. She can’t help the fact that she doesn’t know how I met The Wedding Date or that he has kids. And because she has rather conservative views of such, it’s like Groundhog Day every time we talk. My grandfather, being a typical 1950s husband (and a Latino husband at that) has no idea how to run a household. He doesn’t know how to write a check—literally; I wish I was exaggerating here—and don’t even get me started on cell phones. Even regular phones, for that matter. Moral of the story? They’re moving in with us. My brother, as some of you may know, left the solar energy industry to become a long haul trucker several months ago. As such, he gave up his apartment and moved back home but he’s only around a few nights every month because he’s saving to buy his own truck. Aside from a few minor scuffles over the bathroom soap and whose turn it is to use the laundry machine, he’s been a rather painless housemate. But now my grandparents? They’re an entirely different story. And they bring the grand total up to six. Now, half a dozen grown-ups under one roof isn’t unheard of but it’s not exactly normal for middle class America. By “normal” standards, I shouldn’t be living at home. My brother shouldn’t be living at home and my grandparents most certainly shouldn’t be living at home. We’ve got the twin beds and the Ikea duvet covers to prove it. And just this evening, I had to grandmother-proof my protein bars. But the odds of convincing my grandmother to vote for Obama are about as great as the odds of her teaching me to cook. She hardly ever cooks anymore and even when she does, it doesn’t get much more exotic than rice and beans. The best I can hope for is that she’ll forget to vote on November 6th. I am hoping that once all the insurance/medical issues are settled (until other ailments occur) and once the move is complete, and they have both adjusted to the new routines, lack of personal space, (my dad’s quite ample garage & puttering sanctuary), etc., it will be a LITTLE easier. All I want is 4-6 months of some kind of normalcy with them, before everything takes the inevitable downward trajectory, giving me some time to adjust, myself, before taking on the next hurdles. I can do it, and I will do it because I have a great family to support me. Okay now I have to do what I came on the computer at 5AM to do, find out which libraries are open early today so she can pick out some books, and hopefully actually READ something other than the comics. I’m so sorry to hear about that Kat! It is always tough to deal with sickness, especially when you aren’t used to it. *hugs*. I hope it all works out for you. Not all that long ago my Grandma moved in with my parents after falling a few times and not wanting to wake up my parents in the middle of the night, so she just laid on the floor until morning. Not good. My Mom has been the one to make the most adjustments, but it has worked out so far. Living with my parents has been really good for Grandma, she has company all the time and we don’t have to worry about her not eating because my Mom is a great cook. My mom’s biggest complaint about the whole situation is that at this point in her life, Grandma likes things a certain way and is not about to change her mind (97 years old…who blames her?). Mom was complaining to me about how Grandma was unhappy with some of her dishes–things like chicken caeser salads and shrimp scampii. I told Mom to make meatloaf and freeze individual slices, then on nights where the food was not what Grandma wanted she could just bake a potato and heat up some meatloaf. Grandma loves it and Mom is much happier. Excellent idea! My grandmother is anti-shrimp as well.so maybe we can do some freezer options for her. Glad to hear your grandma is in with your parents now– falling is scary! I always used to laugh at those commercials for those security alert device things for seniors where they’d say “Help! I’ve fallen and I can’t get up!” because the commercials were so cheesy and low budget but it’s a real problem. No. It’s not “normal” for families in middle class America to take in and care for their elders. So your family is WONDERFUL — and a true rarity — for doing so. My grandfather was never diagnosed with Alzheimer’s, but he did pretty much forget everything and everyone at the end, and wish we could’ve — WOULD’VE — been closer for him and my grandmother. I’m so sorry for your grandmother’s diagnosis and I realize that this is a hard md difficult time with you and your mom, and your family as a whole. My grandfather was diagnosed with a very rare disease, super nuclear polsy, which deals with lack of mobility of the limbs and we had him in our home for 2 years. It was one of the ost difficult times as a family but we banded together and took care of my grandfather. So, I think that is amazing for you and your family are going to take both your grandmother and grandfather in. I can tell from your posts that your family is so close, and I love reading your moms comments to your blog posts and you just gotta keep laughing and loving each other. My heart goes out to you and your family during this difficult time but I just wanted to comment because when this happens you can feel so alone with te responsibility you’ve taken on and I wanted you to know you’re not alone. Aww shucks– you all are going to make me cry! But thank you 🙂 And I can’t even imagine how difficult it must have been taking of someone with mobility issues. We’re lucky there– my grandmother is like the Energizer Bunny, she just keeps chugging along! She just doesn’t know where she is going or how she got there 🙂 Thanks again to all of your readers, it is super tough, I’m not going to sugar coat it, we are a busy, busy, busy family with schedules that are CRAZY. That is one of the most difficult things for them to adjust to, we don’t eat at 5PM, nor do we all eat together hardly ever—etc. 2012 livestyles don’t jib with folks in their 80’s–but it will force me to slow down and smell the roses too, gotta stay positive. I’ll have a surprise for Abuela tomorrow, so stay tuned!!! Awww…. babe. I was wondering when you would get around to posting about this…. Lets start with the basics. I envy you. In a lot of ways, I envy you. You will be getting to spend some time with E and V that I never really got to spend with Nana and Grandfather or my other Grandparents… (and no, we will not be discussing the months of my living in Az without mucho vino and a large box of tissues). But, there are a few things you are unaware of. We have a history of breast cancer in the family. (I will get into more medical stuff someday with you. You and I are related by a man and he’s not the most adapt at picking up the things as a woman you should know about…..) You have a “niece” with Autism. So, there are the $1 ribbons to buy at the grocery stores. But I want to talk a bit more about Alzheimer’s. I am a nurse. I currently run a 50 bed retirement home here in Kingston. More than half of my patients have some form of dementia. Yes, it’s sad. Yes, it’s frustrating. Yes, it’s gonna be a rough road. Yes, V is going to make things a bit interesting. But here are my suggestions. There are 3 adults living in the house full time, besides E & V. Make sure that Mom and Dad get one night out a week, just for them. That you and TWD make dinner and “Abuela- sit.” Trust me that Mom is going to burn out faster than she thinks. Tech support needs to pull his share too. He will need to give everyone an afternoon or a night off when he is home. I am hoping that TWD will understand that right now, it’s not just your mother becoming the sandwich generation, but that you will be too. Make the most of this time. Look at old photos with her. Take the time to practice your Spanish – although, it can’t be worse than mine….. Ask her about her childhood. Write these things down. I have to tell you that I consider E & V to be my family too. Yes, it’s been years. But I always remember them being wonderful too me. I remember your great grandmother too, but that’s the price to pay for being 12 years older. Take the time to learn about her and to cherish her. Leave the room when you get frustrated. Call me when you want to cry. Be strong for Mom and Dad. Hold each other close and love one another. Be happy that right now she knows who you are and she can still function. The coming attractions are not pretty. But there is a lot of fun with them too. The comments I hear from conversations are really really funny. I have one that sings when he is happy. My Bonnie lies over the ocean…. over and over and over for hours on end. Now as for V….. you’ll never break him of his “training”. And I’m sure that he’s scared and frustrated and upset and angry and every other emotion he can think of. And in some respect, he might feel like he is loosing his independence. Take him out for a walk. Talk about anything but E. Talk about cats. Or wood. Or the weather. Make him feel special. But to ask him to help with things won’t be the worst thing. Explain that he needs to pitch in. thx, J!!!! We better set a date for meeting in NYC!!! Yes!!!! Yes, yes, yes! And I’m looking at dates for a trip to Kingston, J. Running to work as we speak but I’ll msg you soon! Suggestion: You want to let their lives be as normal as possible, and as autonomous as possible, even with Abuela’s new difficulties. Books to read sound like a step in the right direction. And Abuelo sounds like someone who will want to feel useful and busy and in control of some sphere of influence; the more outlets for this, the better. Good luck. oh, the trip to the library was a trip alright…she really had no idea of how to figure out what she wanted to read, and as her conservative fundamentalist views drive her choices, the selections were even more limited. Attention Authors, new niche genre: Books for Alzheimer’s patients, simple plots for simple minds 😉 AND MORE BOOKS IN LARGE PRINT! You can probably get large-print editions of the books by the conservative/fundamentalist crowd that she swears by. That is apparently what makes her happy, though much of it undoubtedly makes you wince. Knowing the general profile, I’m guessing she already has something of a mini-library of them. Good luck; this is a rough period. If only… she has a mini library of Bible quotes and twisted interpretations of them, that’s about it. Sorry to hear about the diagnosis. My family a history of Alzheimer’s and my mother has shared stories of our paternal grandmother, who passed, coping with the early stages. Knowing what she went through, I am definitely praying for you, as it is difficult at time. As far as your living situation, I’m interested to see how this will affect all involved. To me, your place is quite nice, so they’re going to a comfortable home — filled with love: an added bonus. I hope during this time you’re able to share beautiful moments with both grandparents. I loved both my grandmas and I really miss them and wish they were here to see me in adulthood. Thanks, lady 🙂 It’s good and bad I guess… I’m trying to see it as a positive thing but its definitely got its changes. Sorry to hear this, Kat. Hang in there, all of you. Having had an uncle by marriage who had this terrible condition, I can certainly relate. Really sorry to read this. Such an awful diagnosis for a family to get. My Nana had it, I was very young at the time, but I know it was heartbreaking for my Mum and her siblings.